You walk into your nearest clothing store. A wardrobe update is long overdue. But you’re instantly overwhelmed. You don’t know where to start, and the inflated prices never help. Sound familiar? Of course it does. We've all been there. Fortunately, there are numerous ways to make shopping for your next upgrade less of a grind – both on your time and your wallet. Gentleman, today I’m talking about 21 shopping life hacks for men that store employees will never tell you. Honey scans and tests millions of coupon codes all over the internet while you shop and finds you the biggest discount on everything you buy online. Honey then automatically applies the best coupon to your cart. Click here to add Honey to your browser for free and start saving today! Did you know that Americans overpay 2.5 billion dollars a year? Believe it or not, the source for a lot of it comes from stores wrongfully overcharging for purchases. Look at the receipt immediately after you make the purchase. Does the number in the receipt match the one in your head? If it’s way off, don’t hesitate to politely ask the staff to double-check the charge. Worst case scenario? The staff didn’t make a mistake and everyone goes on about their day. Just the same it’s worth the piece of mind. Want to add some spice to your shopping experience? This men's shopping life hack is all about applying elements of a game to your routine. It can mean using scores, assigning goals and making it competitive. If you're shopping with your kids, for instance, try assigning them specific categories of product to hunt down and start up a scoring system. Gamify your shopping experience and make shopping fun again! Set a score up for yourself! Challenge yourself not to go past a certain price point and keep in mind what you pick up. And always remember to keep your maximum price point low to make the most out of your savings. And stick to it! How could shopping carts possibly be a bad thing? They’re one of the dozens of tricks that stores pull to tempt you into overspending. You’re always more likely to buy more when you can fill up a cart than you would if you have to carry merchandise around. Don't be fooled by heavy-duty shopping carts. Shopping carts have actually grown considerably in size since 1975. 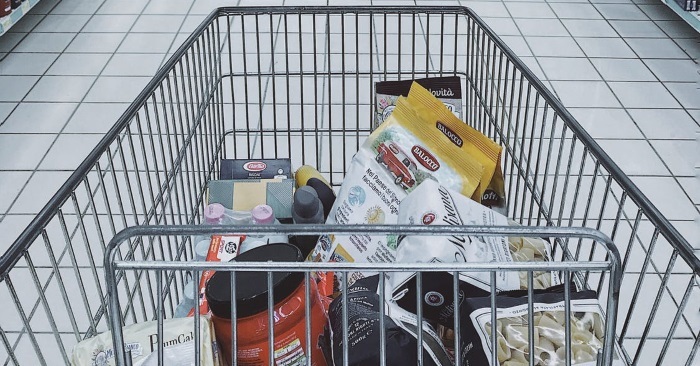 Psychology plays a big part as well – research shows you’re more likely to be shamed into filling up your cart if you see your peers with full carts in the check-out aisle. Stick with a small basket whenever possible. If you’re not grocery-shopping, you shouldn’t be using a cart at all! Same thing applies for bags at other retail stores. There's a reason the cute salesgirl at Bath & Body Works offers you a mesh bag on the rare occasion that you're brave enough to set foot in there. It's cos she wants you to fill it! Politely decline, grab your girlfriend's cumber melon shower gel like she asked you to, and hightail it out of there before you no longer smell like a man! This men's shopping life hack is just about looking out for cheap store tricks. Grocery stores tend to place their most colorful produce up front to give you the impression that it's a healthy place to shop. On top of that, most stores will place essential and discounted items toward the back and tempt you with flashier products on the way. Keep your eye on the prize and don't waver. They drive that urge to buy all the way through the checkout aisles, which are filled to the brim with unnecessary items you can pick up just before leaving. Don't fall for it, gentlemen – buy no more than what you went in for. Even if there isn’t a formal sale on, managers have the power to offer discounts on specific products. It's in their best interest to maintain a satisfied customer base, so they will be open to providing discounts within reason. Check in with managers to see what the best deals are. Most of the men's shopping life hacks we'll be talking about today involve talking to a manager in some capacity, so do not be afraid to approach them regularly. Better still, build a relationship with them and the other sales staff at your favorite stores. Learn their names. Make pleasant small talk when you're in the store. Such courtesies really make a difference to people who work retail, and they respond in kind with all sorts of preferential treatment. You'll be the first to know when sales start and end, and you may even get a piece or two set aside for you or a discount on in-house alterations. Such policies vary widely from one brand to the next, but it never hurts to to be kind. Scan the garment you’re shopping for thoroughly. Check for components that are out of place or tears that shouldn't be there, even if they’re relatively small. You'd be surprised at how many clothing retailers offer this. Try your luck – Show the imperfection to the cashier and see about getting a 15-20 percent discount on the garment. It will only take a few minutes and definitely worth the effort if you can save some money. Wi-Fi isn’t something we tend to consider when we go shopping. Unless it concerns our home Wi-Fi, it’s usually an afterthought to which we let cellular data pick up the slack. However, did you know that many clothing stores offer Wi-Fi-based discounts? Always connect to the store's Wi-Fi for special offers and discounts. Believe it. It’s especially prevalent in large malls because of just how many clothing stores are competing with each other. They all need to draw customers, and free Wi-Fi in a crowded space is the ticket. Once you connect to a store’s network you can often expect to receive coupons for many kinds of products – often in the 10-20% range. Keep an eye on those signals. Before going on your next shopping spree, do your research. You might find most products to be relatively inexpensive online when compared to retail. Luckily for you, this men's shopping life hack is spreading – price-matching. More and more stores are offering to reduce their prices to the better deals that customers find elsewhere. Best Buy and other electronics stores, as well as retailers that sell large appliances, have been price-matching for years. The clothing industry is finally starting to catch up. Don’t expect to price-match Levi jeans with a lesser known brand, but if you find the same brands at a lower price elsewhere, then point it out to management and ask about price-matching. Chances are they’ll give it to you. Discounts and sales should always be your priority when shopping. If you love a product, wait five days and come back to see if it’s on sale. Discounts will always be a factor, but the products they correspond to will shift. If you familiarize yourself with what products go on sale in which stores, you should definitely align those two factors as much as possible. Pay attention to sales schedules. Target, for instance, has a set schedule. Menswear and furniture go on sale every Wednesday, while sporting goods and shoes go on sale every Thursday. Some grocery stores such as Kroger have free items every Friday, which you can find via mobile apps. Temptation is a factor for all of us, but let’s think about this – a simple men's shopping life hack is to resist that urge. Unless you are absolutely in love with the product or you need it right away, wait for sales! Gentlemen, this one is self-explanatory. Be aware of the utility of the product you’re purchasing. Chances are you won’t be returning menswear you fall in love with, but plenty of media and technology falls in this category. Exchange products that outlive their use. This can work to your advantage in several ways. If you’re the returner and enjoy what the store usually has on sale, then consider asking for store credit to keep things simple. This men's shopping life hack is all about awareness. Be on the lookout for times of year where items will be slashed in price. This can mean holidays – Black Friday, Labor Day, President's Day, and the 4th of July are all holidays that are guaranteed to yield big sales across the country. Events such as Christmas sales offer the best deals – but they can also get pretty crowded. Looking for trends in the market will also be beneficial. Take TVs for instance: countless men buy 4K televisions to watch the Superbowl with the friends, but then return it after it’s over. The same applies to men who are gamers when they grow bored with a new release. Returned items likewise often go on sale. If you’re on the lookout for specific products, then stay aware of trends, like the Superbowl, which prompt mass returns of quality products that are subsequently sold at a discount. Self-explanatory. Always ask, and keep your ID handy. No men's shopping life hack yields immediate rewards like this one. This perfect storm of shopping means you can pile multiple discounts for enormous savings. Say you’re a veteran, and a local clothier that offers a military discount also happens to have a sale on trousers. To make things even better, you have store credit from a return you made last week and connected to their Wi-Fi for a 20 percent discount. You’re set to go on a major shopping spree at the store. Stay vigilant for these perfect storms. When the retail stars align like this, you can shop without shame. Whenever you decide to work directly with the store or service, you'll always be more likely to run into better deals than you would through a third party. Dealing directly will get you financial rewards. Hotels are a great example. There are many third-party services that reserve hotels for clients, but calling the hotel directly for a reservation gives you the chance to negotiate a price with the manager. You'll also get a more generous cancellation policy by booking directly. Remember price-matching? These are the perfect situations to bring that into play. Stores will offer to ship products that you couldn't find in the store – especially if you saw them on their website. The best part? Quite often, they won't charge for shipping. Did you buy something online that you're not satisfied with? Another big benefit to dealing with a store directly is that you can usually return regretful purchases in person – assuming you used their online outlet. Worst case scenario, you can at least get a store credit towards an item you really like. More and more retailers are doing this nowadays, and it's understandable. They rely on and highly value your repeat business, and they're happy to offer you members-only sales in return. Go ahead and give them your email address when they ask for it at the cash register. If it's a store you shop at regularly, you'll be glad you did. This men's shopping life hack couldn’t be simpler. Your first priority in clothing stores should always be the clearance rack. You’ll likely find something in your style for half the price. Remember, a pure linen shirt from a lesser known brand on the clearance rack will be the same quality as one sold at full price from a premium name. You'll be surprised at the quality you can find on the clearance rack. Click here to find out how to upgrade your wardrobe without spending a fortune. Now, this isn't an excuse for you to go out and drain your cards, but signing up for in-store cards can yield some rewards. To incentivize customers, stores will often couple their credit cards with considerable discounts when they first sign up and get used regularly. Either that or they'll give little-to-no interests on payments. The best way to take advantage of it? Use the card, but pay it off immediately. Doing this will see you spend responsibly, frugally, and improve your credit score! Brand loyalty will pay off. It's also common for stores to have rewards programs in place. These are strategies used by business to encourage brand loyalty among their clientele. It essentially offers to increment discounts on products the more often you buy from them. If you like a particular store, make sure to ask about those programs. Gents, if this article's taught you anything – it should be to inquire. Whether it's for an imperfection discount or to learn about different rewards programs, you need to be proactive and ask the staff about it. Sure, you'll see discounts on signs but most of the best deals will be located just under the surface. It never hurts to ask about what's available and what the store can offer you to keep coming back. With these men's shopping life hacks, the key is observation. Everything boils down to looking out for the best deals available, knowing where and when they are, and accumulating them. Not it's up to you gentlemen to get into that store, keep your eyes open, and start saving. Best way to start saving when you shop online? Honey There's really no reason not to use this AWESOME browser extension, gentlemen. it's free, easy, and installed with just two clicks. It's got over 100,000 5-star reviews from satisfied customers who saved a fortune. Need more detailed statistics? How about the fact that the average money saved per purchase is $28? Even more fascinating is that RMRS users saved up to $80! Click here to use this incredible shopping assistant and start saving. Don’t assume you have to pay the full price! Get online coupons, coupon codes, discounts, and promo codes from Honey.